Wow! What a weekend! 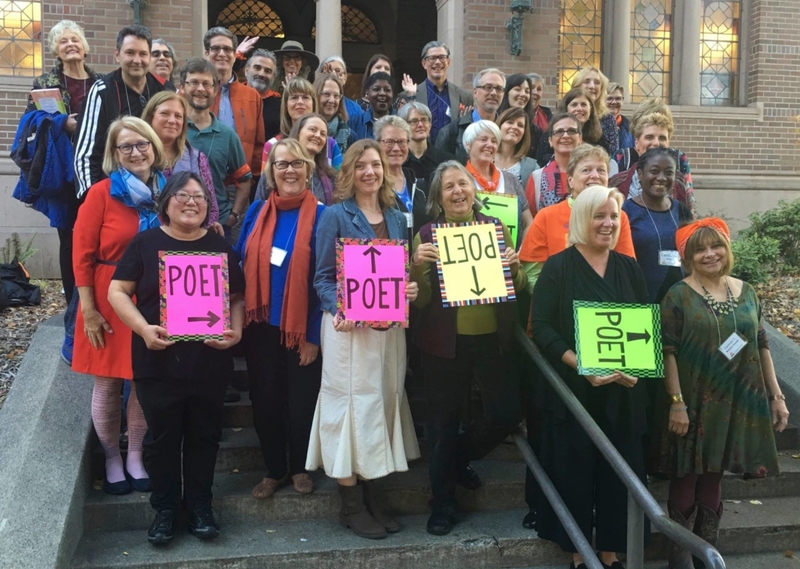 I can’t imagine there has ever been a greater celebration of children’s poetry than the Poetry Camp organized by Sylvia Tag and Nancy Johnson, founders of Poetry CHaT at Western Washington University, and Sylvia Vardell and Janet Wong, the creators of the Poetry Friday anthologies. All four of these wonderful women are doing everything possible to celebrate and promote children’s poetry. On Friday more than 30 Poetry Friday contributors got together to talk about poetry and how to share it in schools and libraries, at conferences, and over the internet. It was such a pleasure to meet and connect with poets from around the country. Holly Thompson made the trip all the way from Japan. Friday night we had the absolute pleasure of participating in a found poetry workshop with Robyn Hood Black at Village Books in Bellingham. Robyn had prepared kits for us—with cards about shells, sticky notes, scissors, tweezers, sponges, stamp ink, stamps, and tiny anchors. She carefully walked us through the process of finding poems on the cards and then turning our cards into visual art. I was reminded how much I enjoy making things. Robyn is a maker extraordinaire, and I have purchased beautiful cards and jewelry at her etsy shop artsyletters. On Saturday we expanded the conversation to include more than 100 local teachers, librarians, writers, and poetry fans. 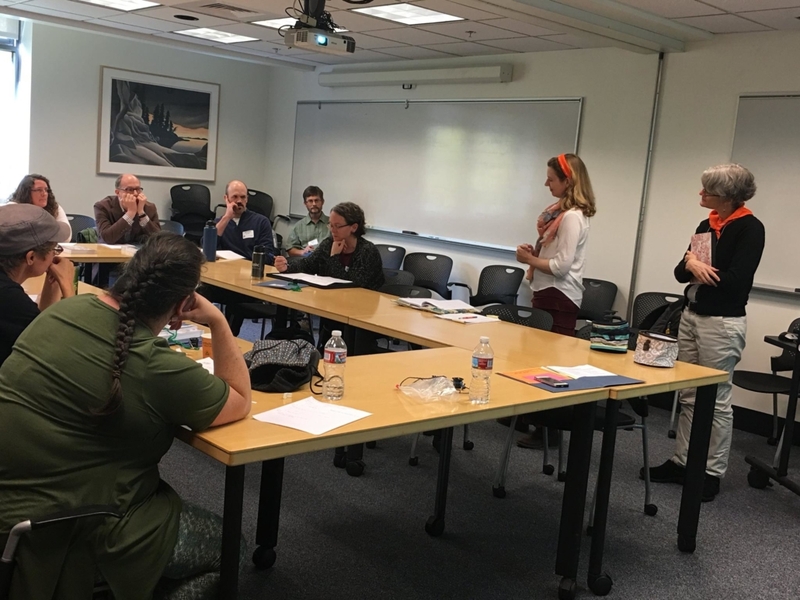 Sylvia Vardell and Janet Wong gave two keynote speeches, and poets offered workshops on topics including: Playing with Sound, Writing for Journals and Anthologies, Poetry and Science, Poetry and Movement, etc. Irene Latham and I led a workshop on simile and metaphor. It was wonderful to work with Irene; I learned so much from presenting with her. The afternoon ended with a performance by the great Jack Prelutsky. Two groups of local elementary school children did a fabulous job reciting a few of his poems; they even pretended to be annoying mosquitoes! Here are just a few of the wise and important messages I brought home. Though I’ve tried to attribute the messages to their speakers, these are my words, not theirs. Forgive me if anything below isn’t quite right. Our conversations were fast and free-flowing and comments built on one another. More than anything else, the weekend was inspiring! For more about the camp and today’s round-up, visit Violet Nesdoly. https://elizabethsteinglass.com/wp-content/uploads/2016/10/14468345_10210222340337994_2945317306476318006_o.jpg 1456 2048 lsteinglass lsteinglass2016-10-06 19:49:532019-04-03 16:18:37Back from Poetry Camp! Oh, I just get more and more jealous (in a good way) and so happy about this. Back in around Sept. 2011 or so, I met J. Pat Lewis at a NY State Reading conference and he told me that others committed to children’s poetry were “out there”, yet I had not found the blogosphere for poets. I had googled, but I was not checking blogs. Then the next month I headed to NCTE 2011 in Chicago and that is where I met Janet Wong, Sylvia Vardell, Heidi Mordhorst, Amy Ludwig VanDerwater and heard about the Poetry Friday world. I knew something of the group from Ed DeCaria’s spring 2011 March Madness and from then on I was hooked and felt I had found “my people”. I know first hand what a difference bringing poetry to the heart of the elementary classroom can make for children and let me count the ways might take a while. A long while. I remain as committed as ever to spreading the love of language and poetry to as many children and teachers as I can and I applaud the efforts of so many in the Poetry Friday crowd of poets, poetry enthusiasts and advocates, teachers and librarians among others who know the power of poetry. Of course I retired from teaching ( 40 short years) in 2011, but still volunteer, substitute, tutor and write about what I think matters for kids. And poetry is and will stay for me the best thing that happened to me in my teaching career, I just wish I had figured it out sooner. So happy you got to go, participate, meet, enjoy and experience this terrific Poetry Camp!!! It needs to become a yearly adventure ( I was planning to put event, but adventure just slipped out of my brain onto the page). Thanks for sharing all of this, Liz!!! Can’t wait to hold your poetry book on Soccer as soon as it comes out! Even though this is Liz’s blog, not mine, I just had to tell you what a beautiful comment this is to read, Janet. Hi Janet, perhaps it took a long time, too long even, but I’m very glad you’ve found your people and very glad that I am one of them. Thank you both. Even though I lack time to interact and post and blog as I would like, I am nourished by the Poetry Friday posts I get to see and look forward to the glorious time of more meaningful interactions and writing. I really love the idea of a conference for the Poetry Friday crowd and the enthusiasts as well. It would need to last a week at least, though!!!! This is education at its finest, really, we pursue what we want to learn more about and share and help and are filled with friendship and creativity and the best nourishment around. Pardon my gushing, but I find it so enriching. And am glad I know you both! This is a place I should have been. I hope it will happen again. Next year when I don’t have a daughter getting married. Ha! I think it will happen again, and I hope that you will be there too. You seem to have missed it for the very best of reasons. What gorgeous wedding photos you posted. Congratulations! Thanks for another great round up of the day. Wish I’d had the courage (and funds) to fly over from Australia – it sounds like a heavenly day! It was definitely heavenly but Australia is FAR! Maybe you could plan a get together for Australian children’s poets? I loved meeting you, Liz, and reading through your memories of this amazing weekend too. I wrote about it myself and just can’t stop thinking about how special it was. I feel so lucky to have had this opportunity! Here’s to doing it all again! It was such a pleasure to meet you in person too. Yes, let’s do it again! I love hearing all about this wonder of a weekend, Liz. Each part seems so special. I love your poem, would have enjoyed that session with Robyn, I know. Thanks for those lovely words at the end too. Thanks, Linda. Maybe if they do it again, you could come too? What a wonderful conference. So jealous here. Thanks for sharing the wisdom. At least when you get rejections, you get to celebrate having tried. Brenda, there were some former editors in the room who also emphasized that they really needed to find things that fit their niche, so many times rejections really are a matter of fit, and need not be thought of as a personal failure. I’m enjoying reading the posts about Poetry Camp! What a wonderful experience for all of you. I know I would’ve loved it. Yes, you would have. Next time? It was wonderful meeting you this weekend. I love your found poem! A nice wrap of of the weekend, too. It was great to meet you too! It’s so much nicer to put a real face to a name and not just a photograph. So many great take homes from what sounds like a glorious couple of days. And I love your found poem, Liz! I used to read Jack Prelutsky (and other poets and writers) to my children to get them to stay at the dinner table and eat! Hi Liz, it was so fun reading your perspective of the weekend. I saw you from afar, but never did get to meet you in person (sigh). It was all rather dazzling while it was happening and I missed doing other things too. (There are some photos that I could kick myself for not taking – asking for). All the workshops sounded fantastic and I wish I could have taken the one you and Irene presented. Next time? There were too many workshops to go to and too many people to meet. I would have liked to go to all of them and meet everyone. Yes, definitely, next time. My goodness, what a fabulous weekend! Love all the pictures, too. What a conference! I had no idea and it’s in my own back yard. Well at least my time zone! Hoping it happens again! You might want to keep an eye on the CHaT website. There may be other events you’d like to go to. What is the CHaT website for events that you refer to? Thanks! I noted that you said there was not enough time to meet all the poets. There needs to be a “speed dating” type time….where you get to do an inside/outside circle and one group rotates and spends 3 minutes with each person, then moves on, connect, reconnect, introduce, etc. Maybe even half way through a conference. But that would depend on the numbers, right??? I know from our discussions about our Highlights experiences that there are pros and cons to larger and smaller groups, but I know the personal time spent has bonded me to many of those at the workshop we were at. Have a terrific day and week. Oh to be poet-ing, but eventually…….and honestly the love of a grandchild is really like no other and wonderful as I have always heard. 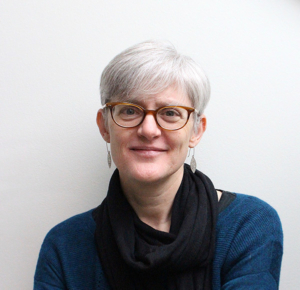 Hi Janet–https://library.wwu.edu/poetrychat The link is also in the first line of the post. I’m so happy you can be a very involved grandma! 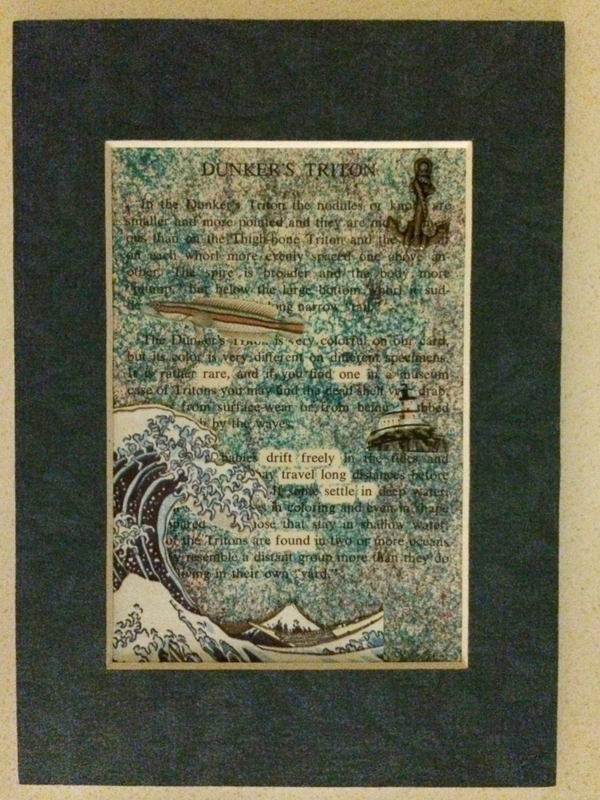 Your beautiful found poem art is inspiring me to create my own, and I love all those wise words. Thank you for sharing snippets of this amazing get-together, Liz! Perfect! There’s nothing better than inspiring someone to make their own. Thank you for this wonderful post, Liz! Loved getting to know you and seeing you and other poets connect!! I have but one word for you, Liz — JEALOUS!!!! So happy you were able to attend this wonderful event. Social media can have that effect on me too! Wonderful post. Just can’t get enough of the western camp. I so want to see a Poetry Camp on the east coast! Your found poem is lovely. Such a wonderful post. It recaptured everything fabulous about the weekend. So good to meet you.